Optical analysis is used often in sensors. Some chemicals change color in response to other chemicals, and there are simple and inexpensive electronic devices that detect such a change. This effect was the basis of early blood glucose monitors in which the glucose in a drop of blood reacts with a chemical on a strip of paper to cause a color change that's read by a simple instrument. The glucose is oxidized, forming hydrogen peroxide as a product. The hydrogen peroxide changes the color of another indicating chemical. Nowadays, electrochemical analysis is used in blood glucose analysis. In the electrochemical technique, the total charge passing between electrodes is proportional to the amount of glucose in the blood. Color change is not the only way a device can affect light. Other techniques utilize the wave nature of light. In the early days of optics, there was considerable debate about whether light was a wave or a stream of particles. One of the first optical physicists, Christiaan Huygens, realized the wave nature of light. Robert Hooke described the phenomenon known as Newton's rings in his 1664 book Micrographia. Today's physicists use Newton's rings as an example of the wave nature of light, but Isaac Newton, for whom the rings are named, thought that light consisted of particles that he named corpuscles. Newton's corpuscles were quite different from today's photon concept. Newton, "Ye Olde Mechanik," saw a mechanical explanation in everything. He thought that a particle description of light easily explained how light will travel in straight lines in a vacuum, and its behavior in reflection. Newton's rejection of wave theory is a consequence of his considering only the properties of longitudinal waves, whereas light is a transverse wave. When light didn't quite behave as expected in its interaction with matter, Newton had the idea that light particles came in different sizes, some of which would fit between atoms, and others would not. For the strange phenomenon of birefringence, Newton had to consider non-spherical light particles as well. William of Ockham's razor must have gone dull between the 14th and 17th centuries. About a hundred years later, light as a wave made a revival in the work of several physicists, including Thomas Young. Young performed his famous double-slit experiment that gave a result that can't be explained by Newton's corpuscles. I celebrated Young's experiment in a limerick that I submitted to an American Physical Society contest many years ago. Dr. Young was having a fit. His optics had developed a slit. So I'll use it this way." And you know the rest of this bit. Now that we've covered the science of light interference, let's look at its utility. The interference of light, as radio waves, is used in phased-array radars. A more extreme example is the phase-shift mask that's used in high resolution photolithography. The wave principle is used elegantly in dielectric mirrors that allow a greater reflection of light than any conventional mirror; and also wavelength selective reflection and transmission of light. Recently, a research team at Purdue University has used the interference of light as a method to read environmental changes in a hydrogel. [2-3] A hydrogel, as the name suggests, is a bunch of water held together by polymer chains. Some hydrogels are formed from superabsorbent polymers that absorb about a hundred times their weight in water and swell to a large volume in the process. With proper chemical additions, hydrogel properties can change upon exposure to chemicals, and hydrogels are used in various biosensors. Some common polymer frameworks for hydrogels are polyvinyl alcohol, sodium polyacrylate and other acrylate polymers. 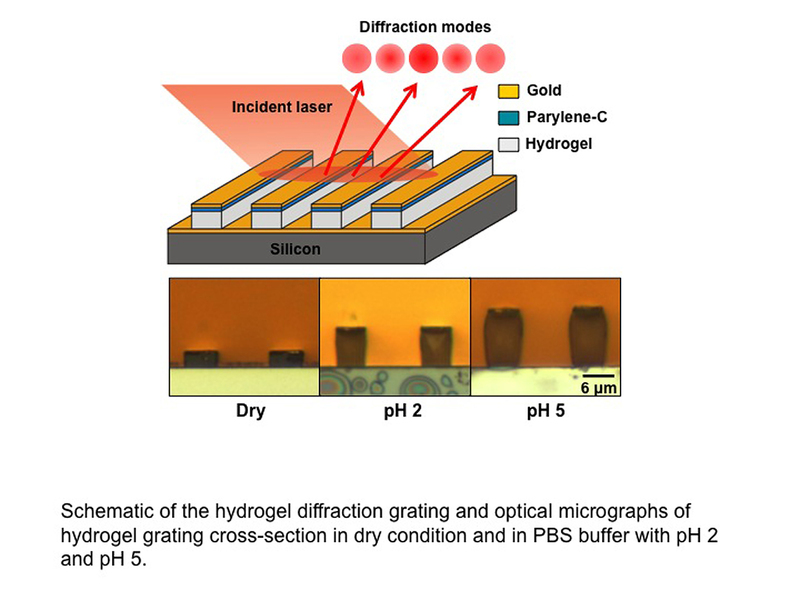 Purdue hydrogel sensor operation, along with a cross-section showing the hydrogel swelling that exists under different pH conditions. (Dry, pH 2 and pH 5 phosphate buffered saline solutions). The Purdue team was an interdisciplinary collaboration between members of the School of Mechanical Engineering, the Birck Nanotechnology Center, the Department of Physics and the School of Electrical and Computer Engineering. The sensor, as shown in the figure, is a grating structure that swells considerably in height with an increase in solution pH. Interference between light reflected from the tops of the swollen grating and light reflected from the bare substrate allowed an optical indication of pH change with 6 x 10-4 pH unit resolution. A gold film is applied to both the grating and the substrate to enhance reflection. Since hydrogels respond to stimuli other than pH, this sensing approach can be used in other areas. Point diffraction peak intensity as a function of changing pH. The above figure shows how the detected light intensity at a point detector changed as the pH value of the solution in which the hydrogel sensor was immersed changed with time. In this case, the sensor was illuminated with 632.8 nm light from a 5 mW Helium-Neon laser. A 100 Hz chopper and lock-in amplifier combination was used to reduce low frequency noise (a.k.a., drift). Equivalent optical and electrical components of the laboratory demonstration can be built into a compact device. "It's a good example of collaborations that can blossom when labs focusing on different research are located next to each other... Professor (Babak) Ziaie's lab was already working with hydrogels, and my group was working on diffraction-based sensors. Hearing about the hydrogels work next door, one of my postdoctoral researchers, Chun-Li Chang thought of making a reflective diffraction grating out of hydrogels." A U.S. patent application has been filed on this concept. I'm an inventor of a birefringent sensor, Devlin M. Gualtieri, Janpu Hou, William R. Rapoport and Herman Van de Vaart, "Birefringent-Biased Sensor Having Temperature Compensation," U.S. Pat. No. 5,694,205, Dec. 2, 1997. Emil Venere, "Hydrogels used to make precise new sensor," Purdue University Press Release, February 8, 2011. C-L. Chang, Z. Ding, V.L. Patchigolla, B. Ziaie, and C.A. Savran, "Diffractometric Biochemical Sensing with Smart Hydrogels," Proc. IEEE Sensors 2010 Conference, 1-4 Nov. 2010 (Published January 20, 2011), pp.1617-1621. A PDF preprint is available here. Linked Keywords: Optics; optical; sensor; chemical; colorimetry; blood glucose monitor; glucose; blood; colorimeter; redox; oxidize; hydrogen peroxide; redox indicator; electrochemistry; electrochemical analysis; charge; electrode; wave nature of light; optical physicist; Christiaan Huygens; Robert Hooke; Newton's rings; Micrographia; physicist; Isaac Newton; corpuscle; photon; vacuum; reflection; longitudinal wave; transverse wave; matter; atom; birefringence; William of Ockham; Ockham's razor; Occam's razor; Thomas Young; double-slit experiment; limerick contest; American Physical Society; interference of light; radio waves; phased-array radar; phase-shift mask; photolithography; dielectric mirror; Purdue University; hydrogel; water; polymer chain; superabsorbent polymer; biosensor; polyvinyl alcohol; sodium polyacrylate; acrylate polymer; phosphate buffered saline; interdisciplinarity; interdisciplinary; School of Mechanical Engineering; Birck Nanotechnology Center; Department of Physics; School of Electrical and Computer Engineering; grating; pH; gold; diffraction peak intensity; Helium-Neon laser; chopper; lock-in amplifier; IEEE Sensors 2010 Conference; doctoral student; U.S. Pat. No. 5,694,205.